Approximately 30,000 to 40,000 people die from liver disease each year, according to the American Liver Foundation. For people who experience acute liver failure, the only proven treatment has been liver transplantation. Researchers at Mayo Clinic have developed and are testing an alternative to liver transplantation called the Spheroid Reservoir Bioartificial Liver that can support healing and regeneration of the injured liver, and improve outcomes and reduce mortality rates for patients with acute liver failure - without requiring a transplant. Developed by Dr. Scott L. Nyberg, principal investigator in the Artificial Liver and Liver Transplantation Laboratory at Mayo Clinic, and liver transplant surgeon, the device uses healthy hepatocytes, or liver cells, from pigs to do the job of a normal, healthy liver, which aids in digestion and the removal of waste and toxins from the bloodstream. Treatment with the Spheroid Reservoir Bioartificial Liver (SRBAL) has been shown to reduce the severity of liver disease and improve survival in pigs. Future clinical studies are planned to assess the SRBAL as a less-invasive, long-term treatment option to liver transplantation. Results from a study using the device in a pivotal preclinical trial were published today in the Journal of Hepatology. To see how the device works and access exclusive video of researchers in Mayo's laboratories, click here. "Acute liver failure claims the lives of over 30 percent of people who are diagnosed with this condition. Liver transplantation has been the go-to option for treating acute liver failure, but it also comes with many risks and isn't always an option, due to compatibility and availability of donor livers," says Dr. Nyberg. "A bioartificial liver device could allow physicians to treat and extend the lives of more patients, safely and cost-effectively, with fewer risks." "This study demonstrated that animals treated using the bioartificial liver responded to the healthy hepatocytes and reached the study endpoint with less disease severity than animals that received other forms of treatment," said Dr. Nyberg. 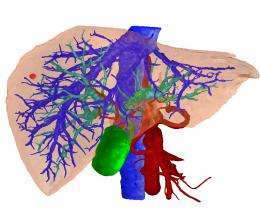 "Although the artificial liver is not yet cleared for use on humans, these findings show promise as an effective treatment option for diseases like liver cancer and hepatitis, which is becoming an increasingly common diagnosis." Mayo Clinic performs approximately 120 liver transplants each year at its hospitals in Minnesota, Arizona and Florida.